Initially known as Kingston, Conway, South Carolina is home to a wide variety of dining, shopping, and picturesque views. Conway, SC was founded in 1734 and is rich with both natural and American history. A drive through the streets of this exciting town will take you through buildings that are designed around live oaks, which are protected by an ordinance meant to safeguard its natural beauty. Numerous historical signs also mark the town’s landscape, giving its visitors an idea of the town’s past. 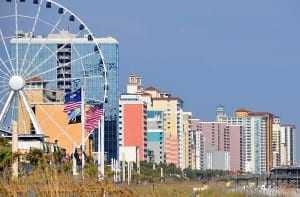 Unlike the Grand Strand, the best ways to discover Conway, SC is possibly by foot since the main attractions here are confined to certain sections of this riverside city. Horry County Museum: The Hurry Country Museum is found at the end of the 5th Avenue in downtown Conway. Popular exhibits include the Waccamaw River, American Alligator, birds of prey and more. Here, you will discover the history of the area. The River Walk: a trip to Conway, SC cannot be complete without the River Walk, which connects the heart of the city to the picturesque Waccamaw River. Along the way, you will be able to explore the Conway arboretum, historic buildings, riverside gazebo, marina, playground and many other things you that will leave you amazed. L.W.Paul Historical Farm: go back in history and experience what life was like on the historic L.W.Paul Historical Farm 100 years ago. This farm gives you a rare opportunity to watch and also take part in the farm activities that took place back then. River Kayak Tours: if you want to get closer to the water, then you need to consider guided River Kayak tours of the iconic Waccamaw River. These tours take three hours and serve both first timers and first-time paddlers. Conway, SC offers an appealing combination of stores and shops. From crafts to wedding gowns and gifts, you can find an array of merchandise along the Conway streets. There you can also find boutique stores like Bodega and popular restaurants such as The Trestle and Crady’s Eclectic, which have been serving locals and visitors for many years now. Rivertown Bistro is another fine eatery, which serves up mouth-watering seafood and American cuisines in a stylish setting that features rooftop dining. There is no shortage of entertainment options in Conway, and the Theatre of the Republic is certainly the highlight of them. The Theatre of the Republic is a historic theatre with lights brightening up Conway’s Main Street, inviting both locals and visitors for an exciting evening of live entertainment. This neighborhood theatre casts local talent in highly acclaimed comedies, dramas and musicals. Conway, SC also has a lively downtown. The best way to discover the area is probably through events organized by Conway Downtown Alive, an organization dedicated to preserving and promoting the city. One of the most popular events is the Rivertown Wine Around. This event is held twice a year and is always a hit! Participants have an exciting task of sampling over 20 wines while exploring local stores. In addition to the wine choices available, participants are also able to discover downtown Conway. If you are into festivals, the best times to explore Conway are definitely during the numerous festivals held throughout the year. These include food fests, holiday parties, music & art festivities and more!